Place all ingredients except for the chocolate in a glass bowl. Microwave on high for three minutes, stir and microwave again for another three minutes. Add chocolate pieces then microwave for a further 2 minutes. Stir gently and pour into a lined shallow tray. 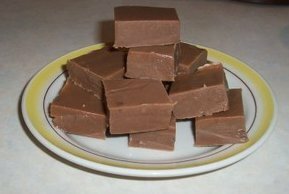 Refrigerate and then cut into 3cm squares.